I happened to run into Tiffany Hinton, author of many beautiful gluten free (+many other allergen-free!) cookbooks, at the Bountiful Eatery (gluten free, healthy quick food restaurant in Chicago) anniversary party a few weeks ago. She graciously offered to send me an electronic edition of her recent publication, Kid Approved: Mom Certified, as long as I promised to hit the kitchen with it! 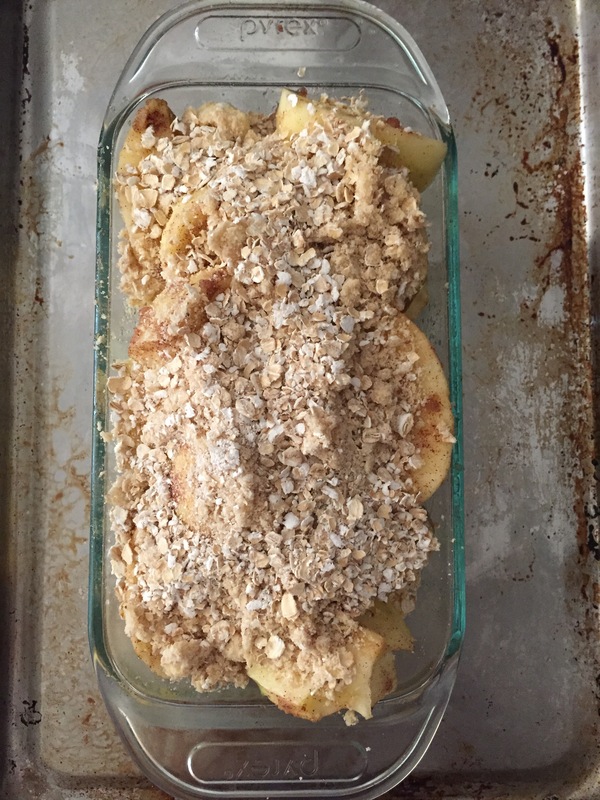 Here’s my review of a recipe I made (with some adjustments to make it more diabetes-friendly): Apple Crisp! 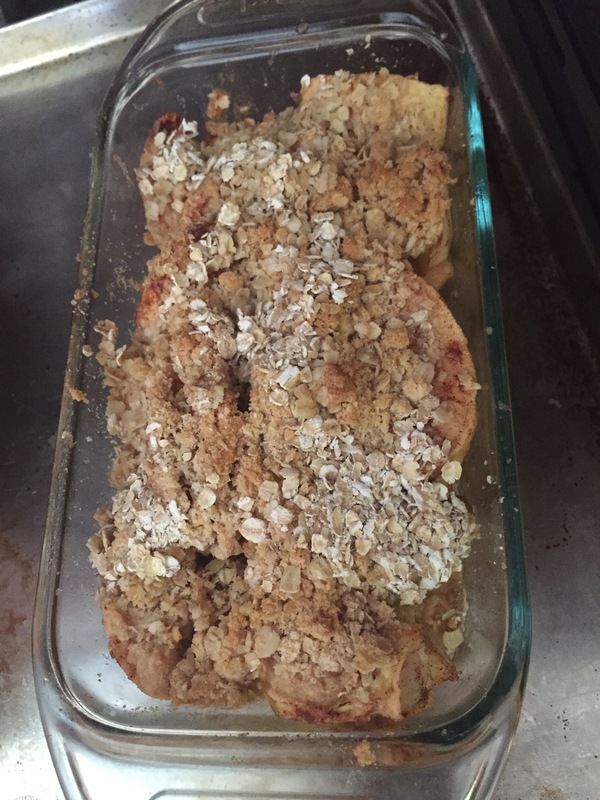 To lay out my alterations up front, I used about half of the recommended amount of sugar, half of the brown sugar, extra cinnamon (yum) and Chex Instant Oats! I noted the recipe called for 1/2 cup of GF rolled oats, but (first) I didn’t have oats sitting around and (second) the only bag at my local grocery store was enormous and almost 20 dollars! I eat the Chex oatmeal packages often before I hit the gym, so I made the substitution for convenience and cost-sake. 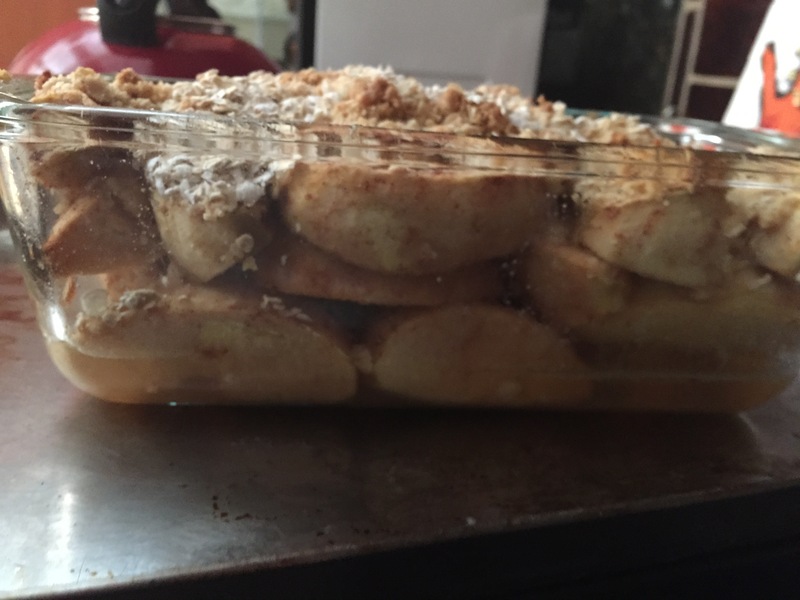 A few things I learned from my creation experience–while the cook book is made to be kid-friendly, many of the recipes (including the crisp) definitely need adult help for things like peeling and cutting apples. I also made note to cut the apples thinner next time, rather than just the width that comes from an apple slicer. The instructions weren’t specific, so it was a learning experience. 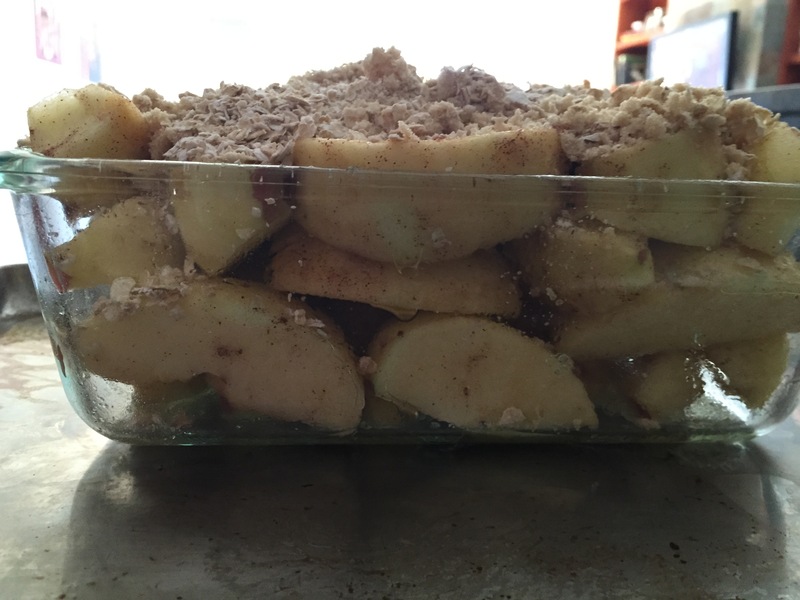 Lastly, the recipe needs to bake much longer to have the delightful gooey apple consistency. I left the glass dish in the oven for 70 minutes, but I believe it could have used at least 20-30 minutes longer. Overall, the cookbook let me channel my inner kid, as the recipes were simple yet enticing with many ‘kid-food’ ideas, and I look forward to exploring Tiffany’s publications that are more geared toward someone who is a more experienced cook/baker! Pre-Cooked Side View–look at those layers! Browned and ready to eat!